Last Monday I covered my first event since the demise of Twapperkeeper: the LIS DREaM 3 workshop at the British Library. This gave me an opportunity to test Martin Hawksey’s TAGS solution, which makes use of Google Spreadsheets to collect and visualise Twitter hash tags. Martin’s instructions and video demonstration made it very easy to set up the archive, and I checked in on it several times before the event to make sure everything was working smoothly. I had the added “belt-and-braces” assurance that we were using CoverItLive to display tweets and provide an alternative discussion space during the event, so there was a separate archive of the event in case I made any mistakes during the TAGS set up. User error was the main risk I identified when assessing the TAGS tool, which is based on the established Google Docs platform and benefits from a growing user base and hands on support from the developer. As it turned out, everything went very smoothly and it really was quite simple to use. 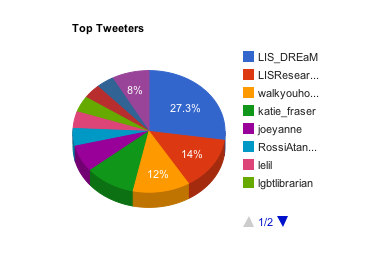 During the event, the TAGS spreadsheet was enabled me to report that we had reached an average of a tweet a minute throughout the event, showed how many re-tweets we had achieved (based on the occurrence of the term “RT”) and showed how many links were shared on the event hash tag #lis_dream3. In addition to this, Martin has created a dashboard which shows some of the basic visualisations we have come to appreciate from Summarizr, which used the Twapperkeeper API. This includes graphs of activity levels on a hash tag and a pie chart showing the proportion of tweets by major players. I notice that Martin has some advanced features that make use of a Twitter developer key, including the facility to extract links shared in tagged tweets. I didn’t feel quite brave enough to attempt using these features this time around. However, I did try out Martin’s TAGSExplorer Beta, which creates an interactive visualisation of Twitter conversations from the public link to the TAGS archive. You can use this to replay conversations surrounding particular people. 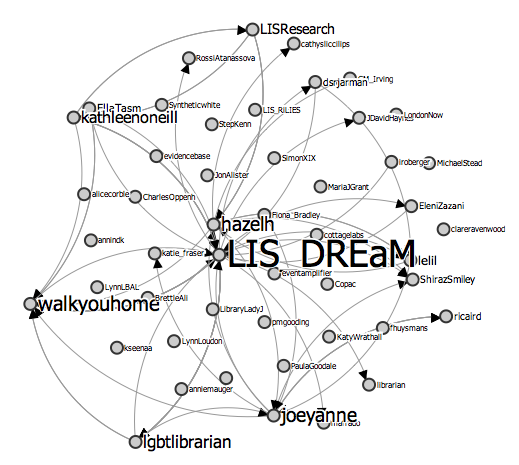 From this, I was able to separate out those who were using Twitter to hold conversations on the #lis_dream3 hash tag and those who did not use Twitter in this way, which in this case was about 50:50. 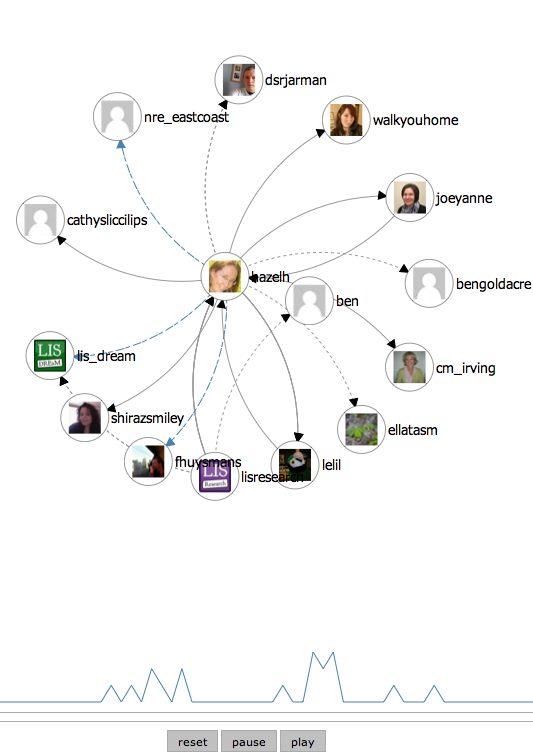 I’m really impressed with TAGS and the TAGSExplorer tools, and can definitely see a role for these in feeding back to event organisers about Twitter activity surround their events. However, the difficulty I face is how to interpret the information provided by such tools to provide event organisers with something meaningful to inform future decisions to amplify an event. This may mean carrying out more comparative work between events to show what is typical and where it can be argued that an event has made a bigger impact than other, similar events. Ultimately, many event organisers want to know how many people have been “watching” the event on Twitter. Whilst this may not be possible, being able to show the potential reach of the event based on the follower numbers of each person tweeting or re-tweeting a tagged tweet would be a really useful statistic to help address this request. I’m looking forward to playing with the TAGS tool further at future events and seeing what the talented Mr Hawksey comes up with next!